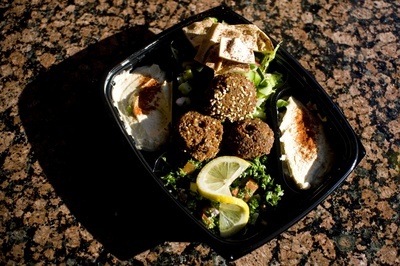 Posted on Thu, Dec 8, 2011 : 5:12 a.m.
La Pita Fresh's petite mezza combines falafel, hummous, baba ghannouj, tabouli and fattoush. 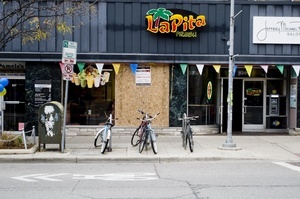 Ahmed Ghannam, manager of the new La Pita Fresh Mediterranean Grill, is confident that this restaurant will fare well, despite the plethora of Middle Eastern restaurants in downtown Ann Arbor. "Our flavors are the best" of any Middle Eastern restaurant in town, he said. This restaurant, which opened in May, is the third of its kind, joining one in Detroit and another in Dearborn. Ghannam says Ann Arbor was selected to tap into the student clientele. The restaurant is a cozy, appealing space, with walls in hues of yellow, adorned by various Middle Eastern artifacts and hanging light fixtures with a similar, authentic look. There are booths large enough for parties of six or more, along with several smaller tables. All tabletops are made of shiny granite. You place your order at the counter, then can either take out your food or dine in. On our first visit, two sandwiches, soup and salad were delivered very quickly, within five minutes, while a more extensive order the second time around took longer, though was still turned around in a respectable 15 minutes. Hours: 10 a.m.-11 p.m. every day. Prices: Inexpensive. Sandwiches are no more than $4.69. Entrees are $10.95. Both the baba ghannouj and hummous were quite good, creamy and hearty. I was less fond of the thin, brittle pita and prefer the soft, puffy pocket version offered at some similar establishments, which I think are a better foundation for both of these spreads. Another appetizer we sampled, fried kibbie, was moist, with perfectly cooked lamb accented with cracked wheat. Though it was fried, it wasn't greasy. The highlight here were the sandwiches, in particular the chicken shawarma. I could have happily munched on just the chicken, so moist and well seasoned it tasted like it was recently grilled. It was made even better by a savory sauce full of garlic. The falafel pita contained a slightly spicy sauce, and was similarly first-rate. I sampled one of the gourmet baguettes, smoked turkey and mozzarella. The bread didn't taste fresh and was tough to chew. But the turkey was so fresh that I plied it off the bread and enjoyed dipping it in the heavenly garlic ranch sauce. All of the sandwiches are extremely large, enough for leftovers the next day. We washed down the tangy sandwiches with one of the dozens of beverages from the "liquid health bar:" strawberry punch. It combined fresh strawberries, bananas, orange juicy and honey. I thought the honey didn't meld well, and made for a less appealing smoothie than if it wasn't included in the mix. The exterior of La Pita Fresh. I didn't particularly care for the lentil soup, which could have benefitted from a more complex texture and had a bitter, vinegar-infused taste. A beef option we sampled, beef shawarma, was disappointing; the meat was overcooked and wasn't complemented by the sauce. However, I thought the slivered almonds sprinkled throughout the moist, well-cooked rice was a nice addition. The same could be said for the abundant chunks of fresh feta cheese in the Greek salad. Be forewarned: there was so much garlic in most of the dishes we tried, you're bound to experience a strong after-taste. It will be interesting to see if La Pita Fresh is able to woo the intended crowd, especially since it's in a less populated area on East Liberty where similar establishments have been known to suffer. Still, there are enough appealing items on the menu, along with reasonable prices and quick and friendly service, to recommend it. Mon, Dec 12, 2011 : 2:09 a.m. This place is my least favorite of the group. We had to change our two orders since they were out of them. Our two mealswe selected were dried out. Hard to believe they would be so dry since I heard the microwave beeping to signal my food was ready. Didn't think microwaves dry out food. Service wasn't good either. Constantly forgot a few items we ordered. I think the best is La Marsa. Ali Baba has always been good but they seem to have cut some quality over the years. Maybe they will sharpen up a little now that there are so many of the same kind of places around. Thu, Dec 8, 2011 : 6:11 p.m. There's already several failed businesses on that block, and Ann Arbor already has several low-cost generic Middle-Eastern / Mediterranean retaurants. The fact that they're two blocks from Jerusalem Garden and maybe four or five from Ali Baba's does not bode well.